Planning Permission has been granted to house the tapestry in Galashiels as part of a project to revamp the town. A planning application has been submitted to create the Great Tapestry of Scotland visitor centre in Galashiels. The Leader of Scottish Borders Council says he is "delighted" that the Great Tapestry of Scotland will be permanently stationed in the Borders. Councillors voted for Galashiels as the new home for the giant artwork. It means a visitor centre will be created for the community arts project which councillors say has the potential to deliver a "successful tourism and regeneration proposition." “I am delighted such a nationally and internationally important arts project is coming to the Borders. Councillors were presented with a report that set out the details of a comprehensive due diligence process. “That process has convinced the Scottish Government to provide £2.5m and we hope the proposal will benefit from enhanced support from a range of other funders. “Notably, the proposal has a wide range of significant community support. "The Galashiels option provides greater flexibility for educational and community uses within an affordable, deliverable and well located site. “It means a world-class tourist attraction can be provided in this town centre location, close to the new Borders Railway and benefiting from excellent road links. The decision by Councillors to go with the former Post Office and Poundstretcher buildings in Galashiels as the site of the Tapestry also means the Scottish Government’s previous £2.5million funding pledge is confirmed. In total, the project will cost £6.7 million. “I welcome today’s decision by Scottish Borders Council, which opens up the ambitious prospect of a new home for the Great Tapestry aligned with the broader tourism, regeneration and community benefits to Galashiels and beyond. Councillors in the Scottish Borders have agreed that the Great Tapestry of Scotland will be displayed in Galashiels. Councillors voted 26 to 7 in favour of Galashiels. Tweedbank had initially been earmarked to hold the giant artwork, when it was put forward by the former First Minister Alex Salmond in 2014. However, Scottish Borders Council has decided that Galashiels would be the most suitable place. The location of where it will be displayed is not yet confirmed. It's estimated that it will cost around £6.7 million to build a new site for the artwork. An MP has written to the Scottish Government demanding that the Great Tapestry of Scotland is given a permanent home in Galashiels town centre. Callum Kerr - who represents Berwickshire, Roxburgh and Selkirk - says that putting it in Galashiels would help to revitalised the town. “It’s clear that the presence of such a remarkable attraction in the heart of Galashiels could be transformative for the town centre, which is still struggling to recover from long term economic challenges in the retail sector. 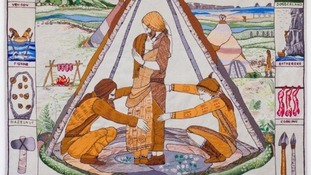 An alternative home has been suggested for the Great Tapestry of Scotland, which had been set to be based at a £6 million hub in Tweedbank. Plans for a controversial six million pound scheme to permanently house the Great Tapestry of Scotland in the Scottish Borders have been approved. Scottish Borders Council granted planning permission today for a two-storey building for the tapestry at Tweedbank. The authority is contributing three and a half million pounds to the project which councillors say will boost tourism. Last week a petition signed by thousands, urging the council to drop its financial support, was rejected. The tapestry. Credit: Alex Hewitt. The campaigner who set up a petition against Scottish Borders Council's decision to house a tapestry in Tweedbank, has criticised the council for rejecting the petition. Brian McCrow's petition was signed by more than 4,000 people, and debated by councillors today. The main concerns were the amount of money the council is investing in the project - £3.5m - and the decision to locate the Great Tapestry of Scotland at Tweedbank, rather than a town with a more textiles-based history. It's not unexpected. I thought there would be some closed minds in the council and there were." I think it was the right decision. Elected members carefully considered the petition and we had a very good debate about the evidence." What is the Great Tapestry of Scotland? It's a controversial topic, because the council is putting £3.5 million towards housing it at Tweedbank. But what is the tapestry? A petition against plans to permanently house the Great Tapestry of Scotland in Tweedbank has been rejected by Scottish Borders Council. The complaints were discussed at a meeting of councillors today. Amongst them were concerns that the plan is too costly - the council has agreed to put around £3.5m into the construction of a purpose-built centre for the tapestry. The concerns could have gone before a full council meeting, but that will not now happen.